The Trace line of products is vast, but we can offer nearly all their products at a discount. 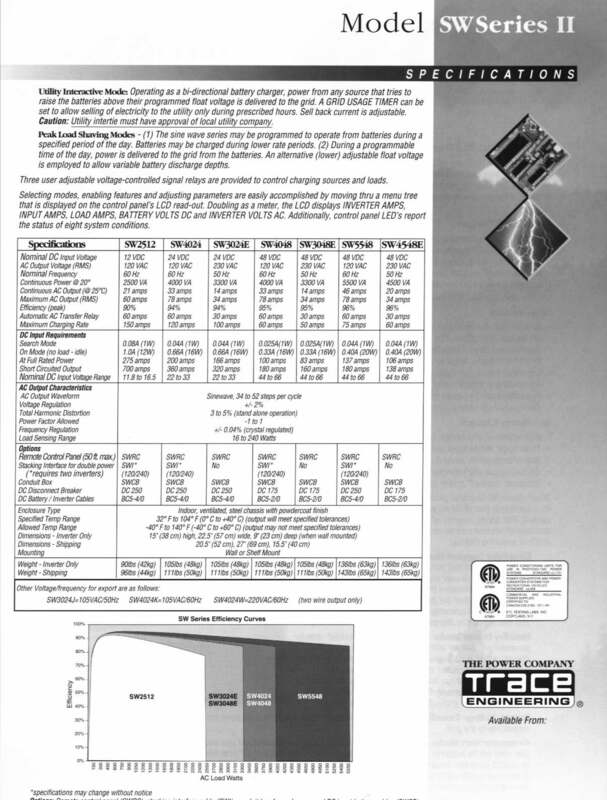 For a complete listing of Trace products and their retail prices see Trace Retail Price List and for Additional Trace product Information. Inverters are used to convert battery power into AC that can be used in your home. The choice you make is critical to the success of your solarinstallation. The inverter must work 24 hours a day, 7 days a week, for years. 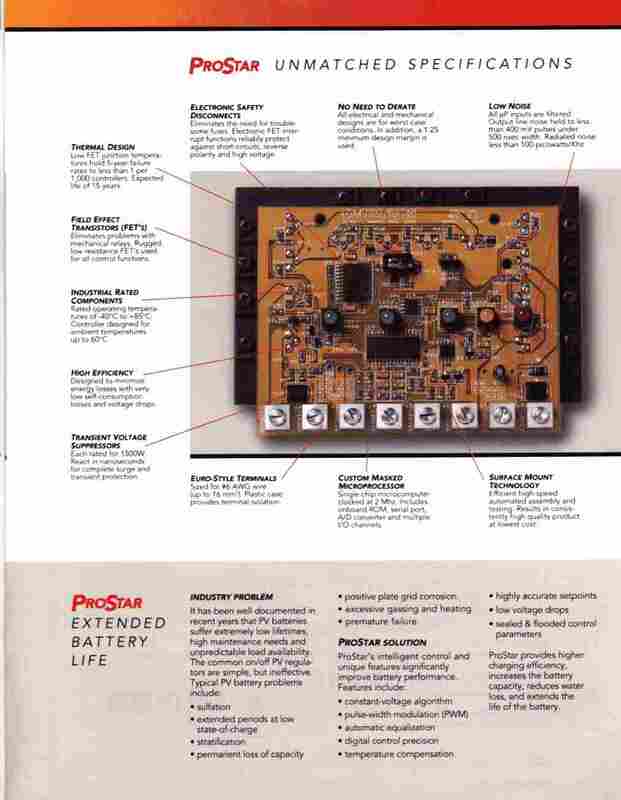 The following is a listing of inverters that are capable of this kind of reliability. While quality and reliability aren't cheap, these two attributes are essential to value! 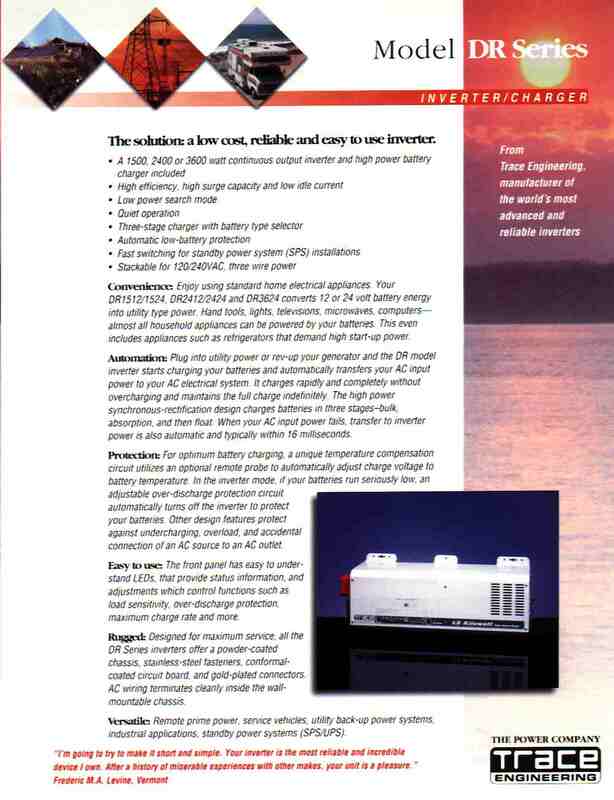 One of our favorites is the DR series of inverters by Trace Engineering. Here is literature that describes this series. 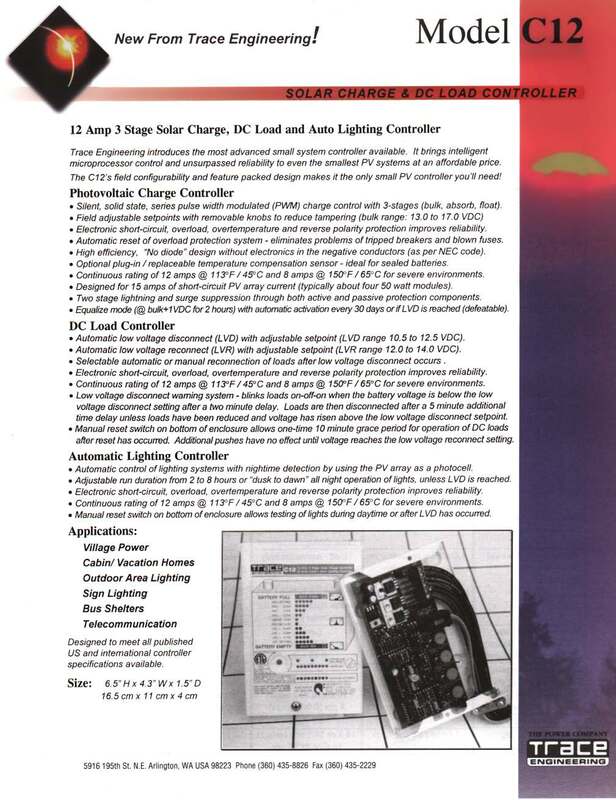 DR Inverter Literature page1 and page 2. 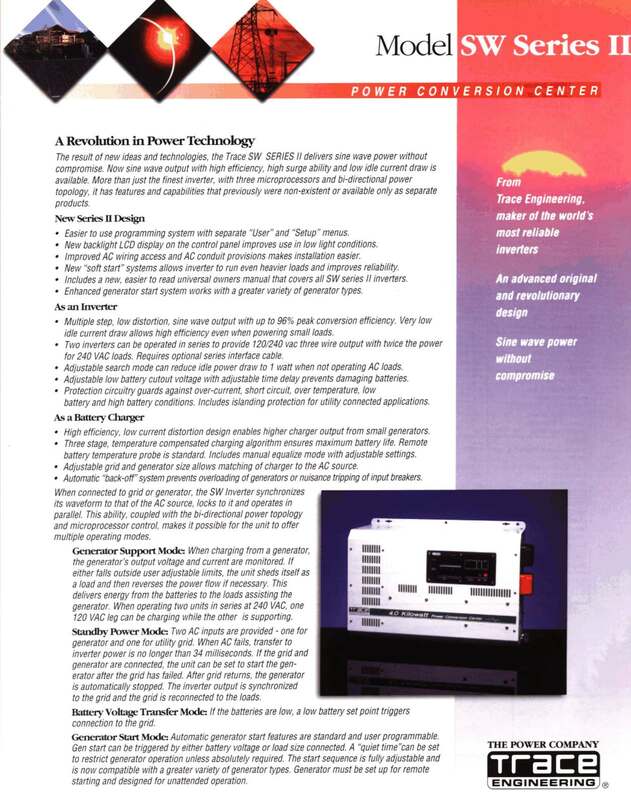 This type of inverter is called a 'modified square wave' inverter. 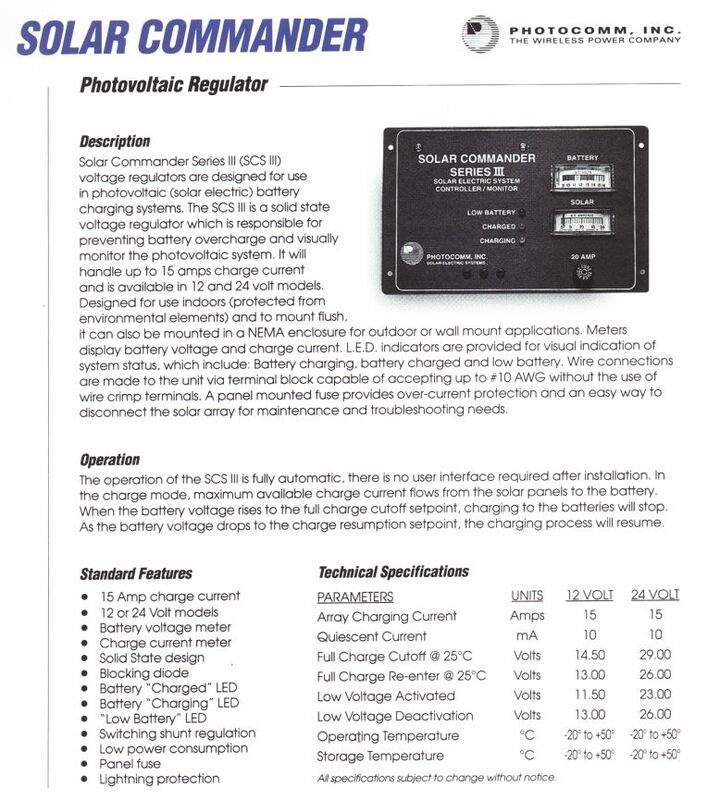 Unlike the old style square wave inverters, these units offer a wave form that works very well with most electronic equipment. These units feature excellent voltage and frequency regulation. The wave shape is close enough to a sine wave that I've never seen anything that didn't work well on one of these inverters. If you have the money and the need, true sine wave inverters are the best way to go, but their increased complexity raises the costs. A true sine wave inverter will increase the water flow from an AC well pump as much as 30%. Electronic equipment that is sensitive to power line noise may also benefit. We use two DR inverters here, and we have been very impressed with their performance. 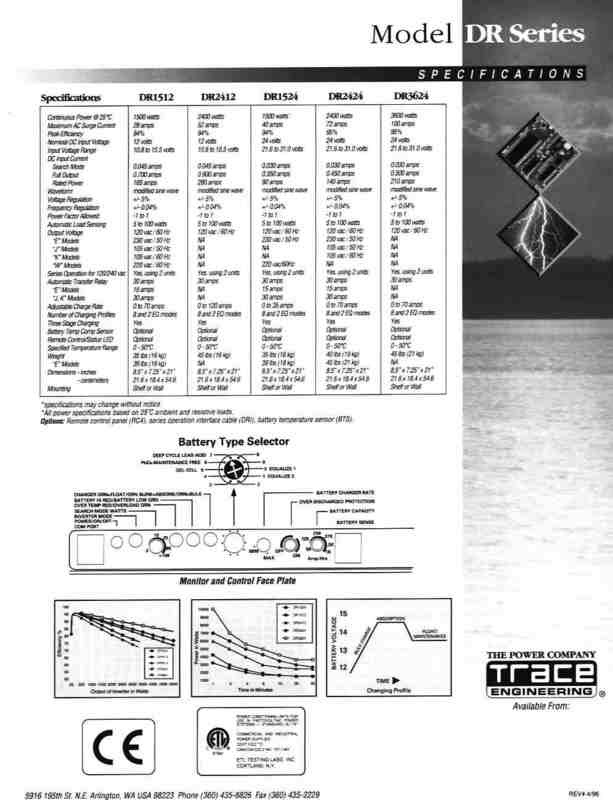 The Trace inverters that follow feature true sine wave output, and can deliver cleaner power than a public utility company. This is no exageration! They also support features like auto generator starting, optional remote controls, and much more. 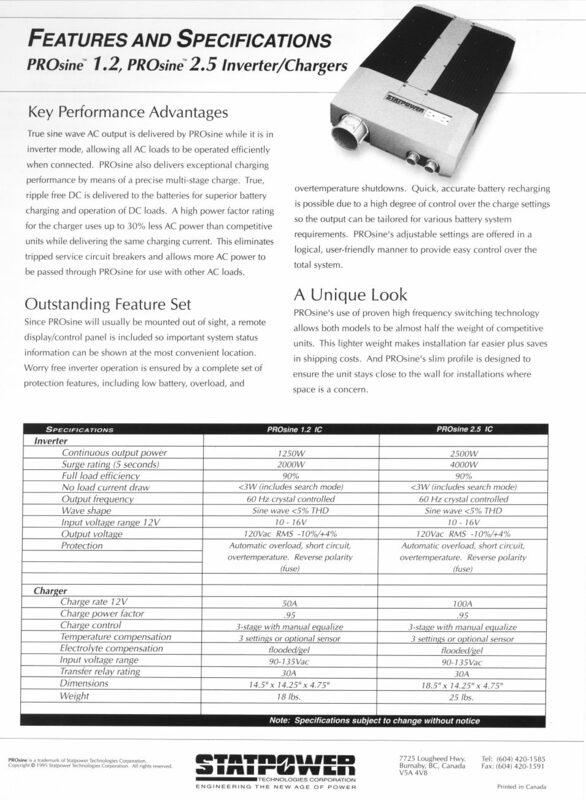 These units set a new statndard in sophisticated, state of the art performance, and they are built to last! Literature for this series consists of Trace SW Series Page 1 and Trace SW Series Page 2 . Read or print these pages to study at your leisure. These inverters are well made, and suitable for many applications. They are also very competitively priced! 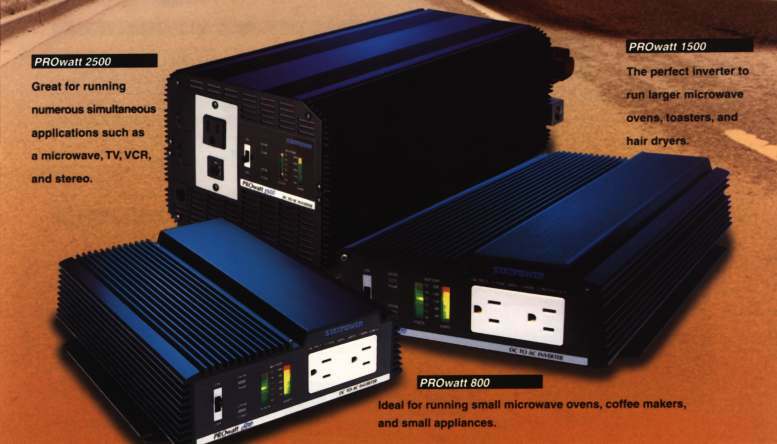 While the Trace is our all around favorite, we are proud to offer this line of inverters as well. 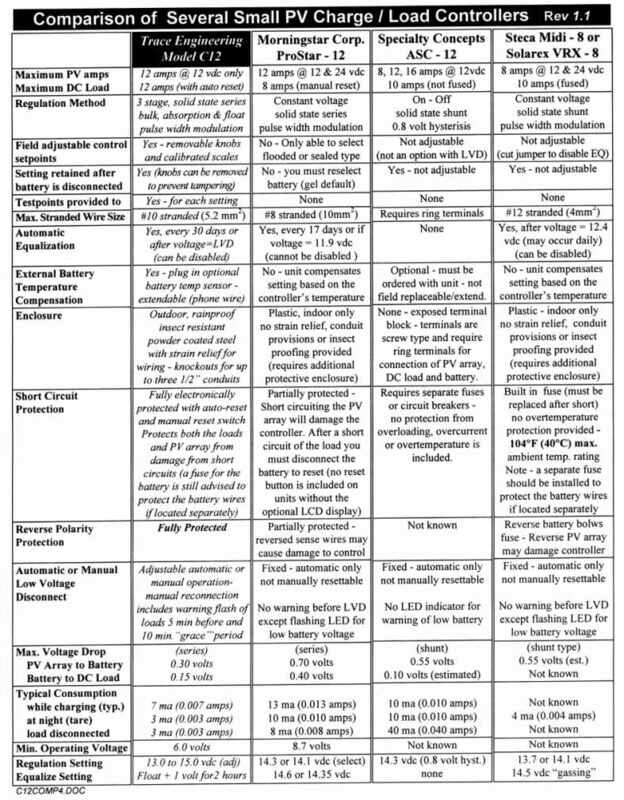 The only critical feature they are missing is the built in battery charger common to most inverters in this power class. 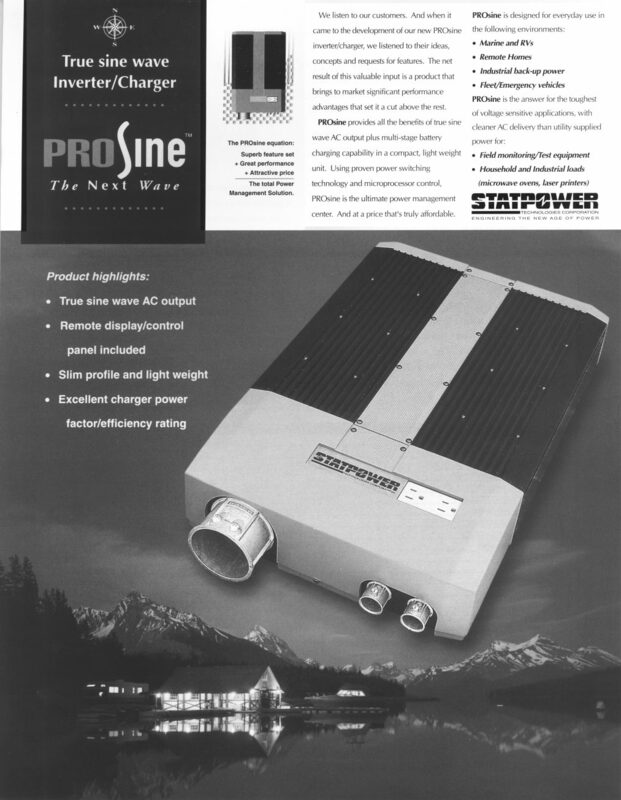 The next series of inverters from StatPower is more exciting. 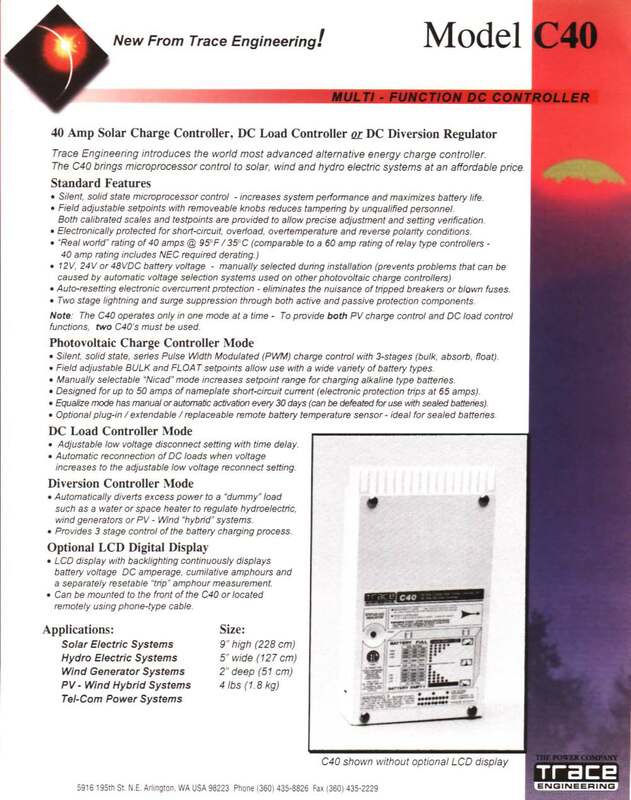 These inverters feature pure sinewave output and have a built in charger system. If your system will be, or is, based on 12V, these are an excellent choice! 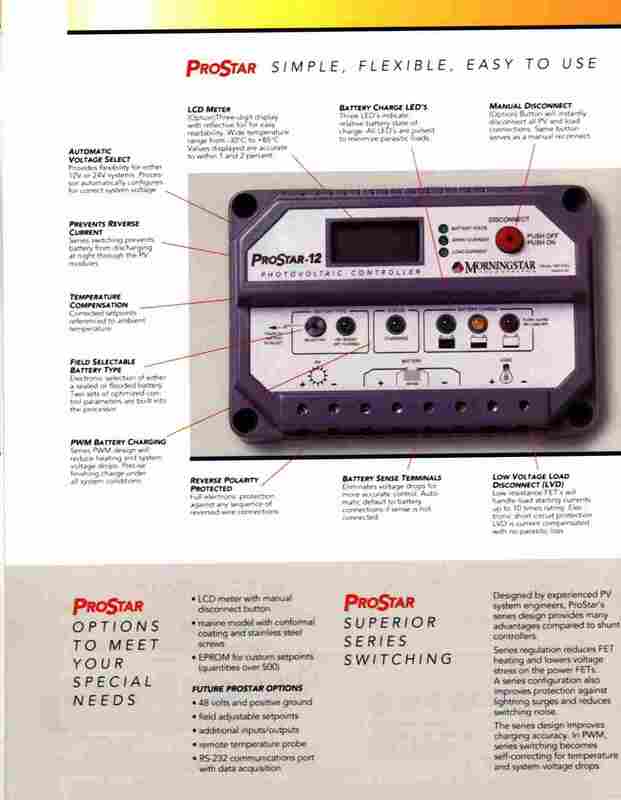 Literature for this series consists of Pro-Sine Inverters Page 1 and Page 2 . 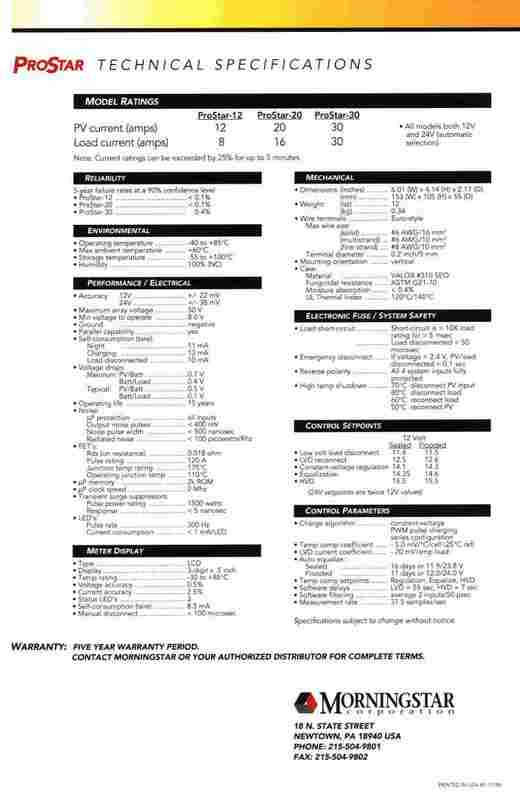 Read or print these pages to study at your leisure.